Here's a fast and simple way to make all your flat, prefold and shaped diapers into easy Velcro®-closing diapers! Just cut one piece each of both hook and loop Velcro®. Sizing: Small - cut 12" (31cm) long; Medium - cut 18" (46cm) long; Large - cut 24" (61cm) long; XLarge - cut 30" (76cm) long. Trim off all the corners, into curves. Sew together, around all four edges. That's it! One fastener is all you need! If you wish, you could make one or two more, in case one gets soiled or lost. Is that too much work?? Then you could just buy the One Wrap Velcro straps - no sewing involved! Care: Wash by hand in the sink and hang to dry for longer wear. To Use: Simply place the diaper on your baby as you normally would. But, instead of using pins or clips, simply wrap this Velcro® diaper fastener around the diaper at your baby's waist, with the hook side facing the diaper, overlapping the Velcro® at baby's front (or back, if your baby can undo the strap!) to fasten. 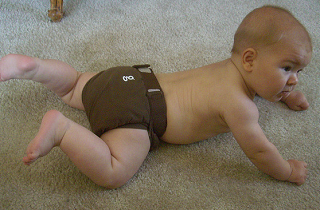 The Velcro® hook part helps to hold the diaper in place. Make sure the hooks are completely covered by the diaper, or they may irritate your baby's skin.